Product Spotlight: Forever Lovely Bundle from Stampin’ UP! Join me today on Facebook live at 10:30am PST as I create the cards featured here. 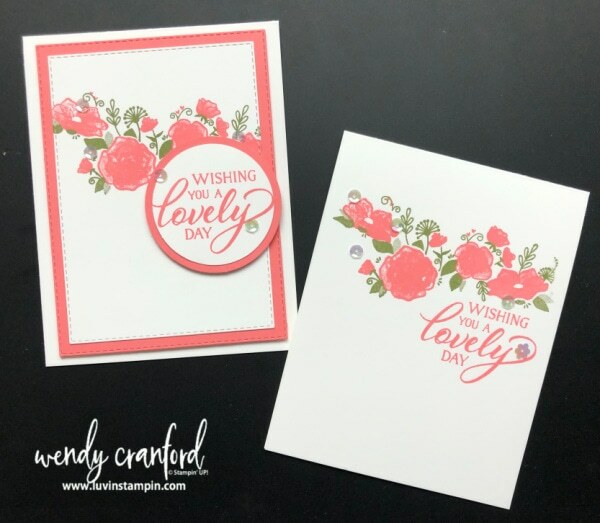 Forever Lovely is a beautiful stamp set and bundle and makes beautiful cards. The sentiments in this set can be used for a lot of different purposes. The cards I made today are for birthdays. 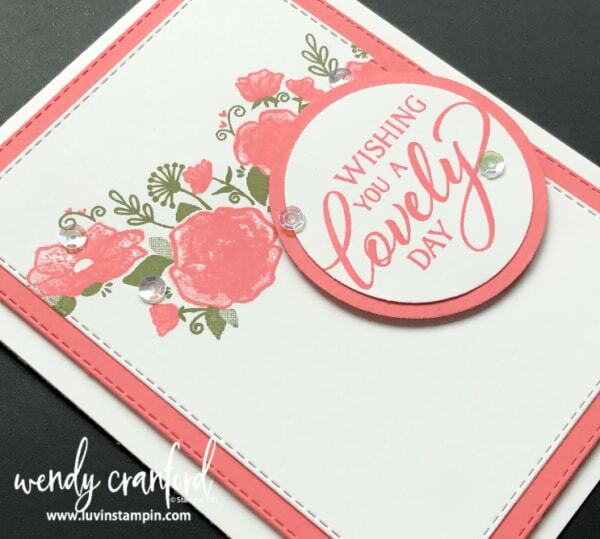 + The flowers, sentiment and card stock layer are all Flirty Flamingo, creating a monochromatic look and feel, which is very pleasing to the eye. + Last I added some of the adhesive backed sequins to finish off the stepped up card. I have this bundle and I love it! I didn’t take it to a class last week because I wasn’t sure how to use it yet! So, Thank you for showing us how to use this stamp set! I also made a 4″ x5 1/4″ front of card with the die, the longest one. But, forgot to match everything up!. So out it went, I haven’t tried again yet! But, I will. I have 32 grandchildren and love making cards for all of them as well as other family members. So, I get a lot of use from a bundle like this, once I learn how to use it right. LOL! As far as a Vlog? My computer underscored it! LOL! I think it’s a great idea. I’m so excited that you’re going to Greece! My goal is to take my husband to Hawaii. But, I can’t very well do that without customers. I haven’t given up yet! But, I don’t know how much longer I can hold on! Sorry, Wendy, didn’t mean to cry on your shoulder! I’m at a lost of how to find customers. Thank you for letting me vent! I’ll keep trying. Five years is my limit. I’ve already been with SU! 3years on the 6th of January! So, I’m not a quitter! WOW! 32 Grandchildren! That’s insane. HAHA! If you really want to get a business going I HIGHLY recommend joining Ronda Wades Creating Success Training Program. IT’s incredible and I have belonged to it for 7 years. If you’d like her link let me know.